Downtown&apos;s historic Angel&apos;s Flight railway has been gathering dust for two years, but a new petition from fans of the funicular might help get the vintage trolley moving again. Richard Schave and Kim Cooper, local historians and operators of the unique Esotouric tour-company, launched a petition earlier this week, asking the city to reopen the railway at S. Hill St. between Third and Fourth streets. A bright orange vestige of the city&apos;s past, the block-long, two-car railway was shut down two years ago for safety reasons. The petition asks Mayor Garcetti to "help cut the red tape in Sacramento and San Francisco" so that the nearly 115-year-old railway, also known as a funicular, can operate once again. The railway has closed and reopened a number of times in its long history, but the petitioners claim the safety issues have been resolved. The petition has already gathered the support of over 1,000 signees to reopen what is billed as the "shortest railway in the world." Schave and Cooper contend that the incident in 2013—in which one of the train cars derailed with no injuries—has been investigated and addressed. According to investigators from the National Transportation Safety Board, Angel&apos;s Flight operators were "using a tree branch for months to bypass a safety feature when one of the cable cars derailed." Yikes. New safety equipment, however, was added and tested "in the presence of State and Federal officials in February of 2014." So, what&apos;s hold up now? Apparently, the California Public Utilities Commission is requiring that a walkway be installed next to the funicular&apos;s tracks before it can reopen. But the petitioners argue that experts have said the evacuation walkway is unnecessary and could even be a "foreseeable hazard" if installed by the tracks, the cables and the electric third rail. To relieve the holdup, they&apos;re hoping that Garcetti will help clear up the debate and reopen it in time for the commencement of Angels Flight&apos;s 115th year. 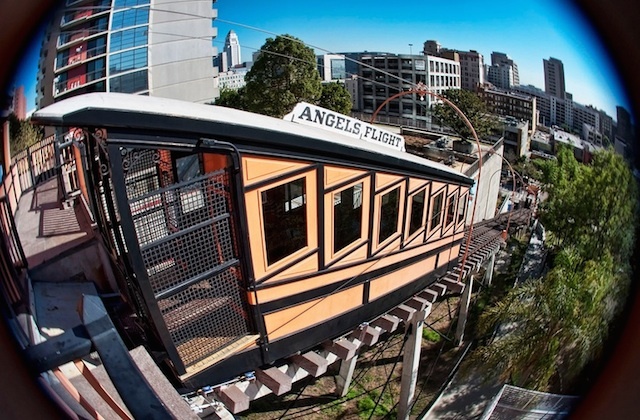 Angel&apos;s Flight first opened on Dec. 31, 1901—when rides cost a penny—carrying passengers up and down the 33 degree incline of Bunker Hill, once home to historic Victorian houses. In 1969, the railway was dismantled when the neighborhood&apos;s buildings were razed to make way for the skyscrapers we see today. It was reopened half a block from the original site in 1996, where it operated until 2001 when a crash caused the death of one person and injured seven others. It then reopened in 2010, but was closed again for the month of June in 2012, then operated until its most recent closure in 2013. If reopened, Angel&apos;s Flight could once again serve as an attractive destination for tourists and locals, as well as a convenient shuttle for workers headed from Bunker Hill&apos;s skyscrapers to Grand Central Market. As Schave and Cooper explain, "Angel&apos;s Flight is one of the great historic attractions of our city, a palpable link between the lost Victorian neighborhood of Bunker Hill and the vibrant new Downtown below."